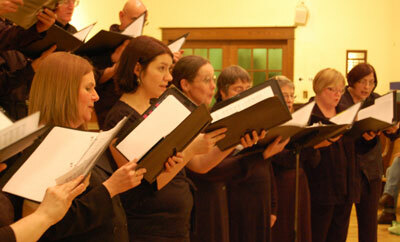 In 2008, Michael Erdman founded Cantemus Singers (meaning “Let’s Sing”), a 12-person vocal ensemble. Erdman’s rationale in creating the group was to take advantage of a niche overlooked by larger choirs that specialize almost exclusively in church music. Cantemus gives equal emphasis to Renaissance and early Baroque secular songs and madrigals, in addition to the motets and sacred pieces of the period. Despite its small size, the group enjoys performing the rich 5 to 8 part settings of the period, not often performed by the average choir. 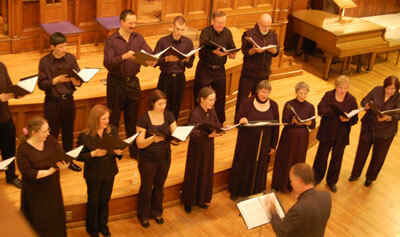 The group mainly performs a cappella, although occasionally partners with instrumentalists to feature Baroque works such as Purcell’s opera “The Fairy Queen”, Schutz’s Christmas Oratorio, and Telemann’s German Magnificat. Cantemus took part in Sing! 2014, Toronto’s a cappella choral festival; and joined the Tallis and Cantabile choirs in a “live” performance of the movie “Gladiator” at the Sony Centre this past December. Members are a mix of semi-professionals and ‘gifted amateurs’, who can sightread the complex polyphonic scores, sing a part independently, and learn a new repertoire in 10 – 12 weeks. The singers range in age from mid-20s to mid-60s. Most are soloists and section leads in local church choirs, including St. Bartholomew’s Anglican Church, where Erdman was organist and choirmaster for over 25 years. The choir gives back to the community by raising funds for two worthwhile charities – the Food Bank at St. Bartholomew’s Anglican Church, Regent Park (part of the Daily Bread Food Bank network in Toronto), and Community Centre 55’s Share-A-Christmas Program that provides food and toys to over 900 needy families in Toronto’s east end. Each May, the choir holds a sale of over 1,000 perennial garden plants to raise money for these causes.